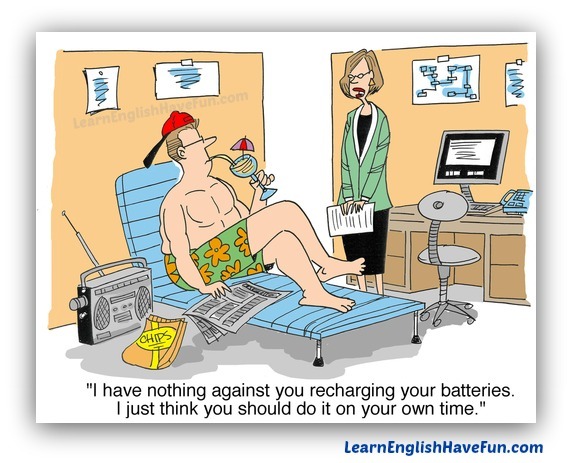 recharge one's batteries: to rest or relax in order to get energy back to do things again. Recharging a battery adds power to it so that it can be used to operate a device (e.g., mobile phone, car, flashlight). Although we don't have batteries inside our bodies we do get tired and aren't able to do as much when we aren't properly rested. This idiom can be used in any 'person' form (my / your / his / her / our / their / person's). Every year we go to San Diego and just lie on the beach to recharge our batteries. My secretary looked so exhausted this week that I told her to stay home Friday and recharge her batteries. I planned to recharge my batteries at home last week but my kids got the flu and I got even less sleep than normal. If you don't take some time to recharge your batteries you're going to feel exhausted and then you'll start hating your job. Our spa is a quiet, adult-only facility where clients usually come for a week to decompress and recharge their batteries. If you don't have the time or money to go on a holiday, an hour massage or yoga class can help recharge your batteries a bit. I'm so exhausted that if I don't recharge my batteries very soon, I'm going to get sick. People who regularly recharge their batteries have a lot less stress in their lives. My wife was so irritable and was crying a lot so my parents are taking care of our kids the next two weeks so she can recharge her batteries. If you need to recharge your batteries I highly recommend the Greenbrier resort. The spa prices are also very affordable. When my kids take a nap I don't think of them as sleeping—I feel like they're recharging their batteries so they can run around the house when they awake. I'm sorry I don't feel like going out tonight. I think I'll just stay home and recharge my batteries. We just returned from our cabin in the woods—no smart phones, television or traffic for an entire week was just what we needed to recharge our batteries. I'm going on a cruise next week—it's been a long time since I've recharged my batteries. If you want to remember this idiom in the future the best thing you can do is write an example or two of your own. You can do this in the comments box below. Thanks!